Inside: Find endless inspiration for DIY fall decor and fall decorating ideas from the best bloggers! Hey there! Come on in! —Yes it’s still in the 90’s outside, but that hasn’t stopped this girl from getting into the fall spirit. 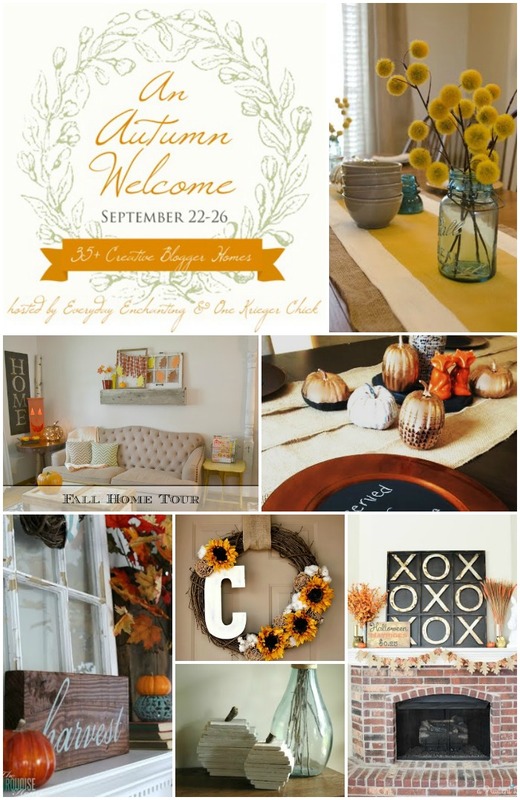 So get in here where the air conditioning is on and take a peek around at what I’ve come up with to decorate my home for fall. 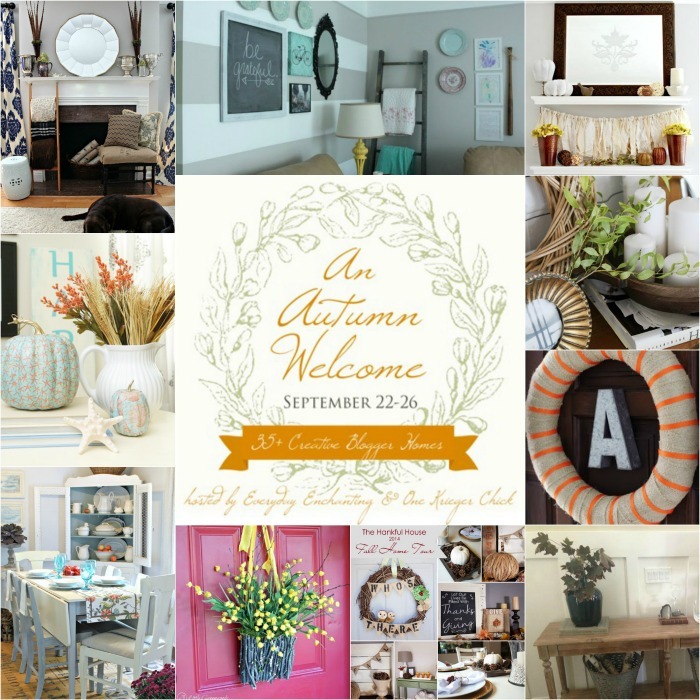 And after you’ve seen my fall home tour, you’re in for some fall goodness cause I’m linking up with a ton of other bloggers this week that are also inviting you into their homes to see their fall decor! –They’re all linked at the bottom of this post. So the only thing I don’t love about my house, besides the unfinished parts, is the fact that I don’t have a mantel. I envy all of those beautiful mantel decorations that I always see! So this year I treated some of the shelves I have in my home just like you would a mantel. Problem solved! This one is in the room where we spend the most time — our family room, and it’s one of my favorite fall vignettes. RELATED: How Did We Create That Built-in In the Family Room? Because I don’t necessarily go overboard when it comes to decorating, (partly ’cause I don’t have that much fall decor stored up…yet) I decided to focus on a few key places on the shelves. That way there’s one big statement rather than a lot of little spots here and there. So I stuck to the middle shelf and just added a few things to one shelf on each side. Oh and that big pumpkin thing at the bottom is where my lil’ lady has a ton of fun making different felt pumpkin faces. I printed out this awesome free fall printable over at Nest of Posies. It added the perfect focal point to my “mantel” and was so cheap to have printed! Then I just added some splashes of orange with some fall leaves that I literally bent around a wire hanger made into a circle, and mini pumpkins. I also made the gold leaf garland and that cute little scarecrow is a must have on my shelf this time of year cause my lil’ lady and I made it together a few years back. In the rest of the living room, I kept it pretty simple by adding just a few more splashes of orange with some graphic orange zippered pillow covers that I made! I’m sorta digging the orange with my blue and grey color scheme, aren’t you? You can also see the kitchen from this room, so let’s head that direction! In my kitchen, I applied the same rule of focusing on one spot, rather than the entire kitchen. I have a few open shelves that worked perfectly for this. So I whipped out my favorite Thanksgiving sign and added a few touches of that bright orange color that I love so much with some fake flowers and mini pumpkins! So we were just in the back of my house, which is where we spend the most time, but if you walk toward the front of my house you’ll see the dining and living room. I just completed my dining room last week so it it is officially ready for some family gatherings and setting a table is one of my favorite things to do. I kept with the bright orange, but added some gold in to make it a tid bit fancy, but still comfortable. I love how this table turned out and the gold accents on the centerpiece and my DIY concrete place card holders are just the pizzaz I was going for. This table is my favorite part of the entire fall home tour! It is just so pretty! Ok. Rip me away from the dining table and let’s head into or just turn around and look at the living room. I just added a few sprinkles of fall on my floating shelves, like the Thankful String Art that I made last year. I don’t know why I didn’t think to put it here last year, but it’s the perfect spot. I also switched out a photo for another fall printable from my very talented friend Alexis at Persia Lou. You can get yours right here. 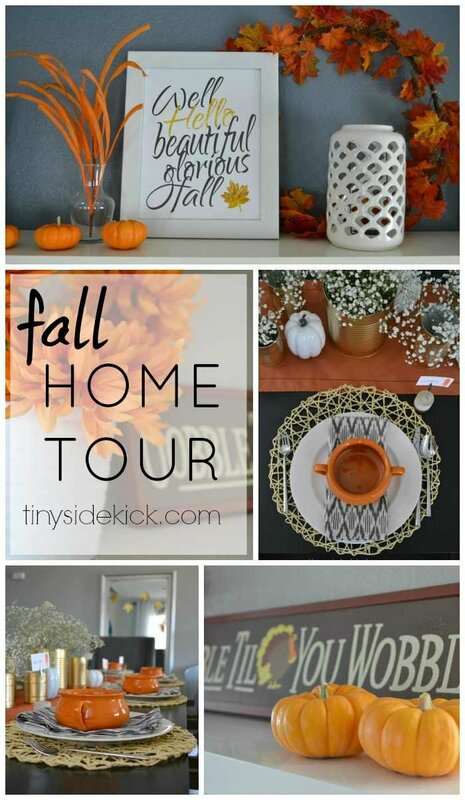 My first thought of doing a fall home tour was a bit scary, but then I realized that I’m probably not the only one who adds just a touch of fall to their home. It can be done in such a simple way and this bright orange fits us just perfectly since it never really is that cold where we live anyway. It’s still fun and fresh, which is exactly our style, but of course fall. I hope you had a fun time poking around my house and there’s plenty more to see! In fact, there’s a whole list below that will take you through the homes of some amazing bloggers that are ready for fall! Beautiful! I am impressed by your work. I enjoyed reading your blog post. Your blog has nice information and I got some good ideas. Thanks for sharing. Beautiful home and great tour! Your decorations are lovely and I love the colours that you’ve chose. Wow! Love, love your fall décor! You are an inspirational to all us moms and wives who want to make a cozy haven for our loved ones. You have given me some great ideas for my fall décor this year. Can’t wait to start some projects. Keep it up! Thanks so much Stacey! I love adding little hints of the season without overdoing and it is a fun way to get my kids excited for the season. Thanks so much for stopping by! I never would have thought of putting orange and gray together, but it looks great!! !so sophisticated! Maybe you ( or one of your readers) can help me with a color problem.My mom got a pine green sofabed at a great price, because she needed a couch and lives in a 1-bedroom condo and needed a guest bed.She recently confided to me that she hates her living room:( When you walk into her condo it screams’ GREEN!! !and she doesn’t like green:( But she’s 84 and isn’t putting any more $ into this condo.I hate to have her hating her living room, which you can see from the kitchen, bedroom, etc.I’ve offered to go shopping with her for Hanukkah( a girls’ day out)to Home Goods, Marshalls, etc, to help her pick out an area rug, wall art, lampsaccent pieces, etc, to bring some other colors into the room. I was thinking about brown or peach. Any suggestions?The only color we can’t do is red( We’re Jewish, so Pine green and red looks very Christmas-y to us. One large green piece can be a statement if it is done right. Let’s see…off the top of my head I’m picturing it done in a bit more sophisticated way. I wouldn’t add too many other “colors” really, but rather keep everything around it pretty neutral. If the walls are neutral (white, tan, or grey) I would add a nice off white throw on one side of the sofa to break up the green and some throw pillows in the same light neutral tones like oatmeal or off white, even a light tan color. Then for accessories I’m loving the idea of silver or gold accents placed around the room, again keeping it all light and airy. I’m actually really loving this challenge. Would you want to send me a photo of the space to my email [email protected] ? I think if I saw it I could definitely share some ideas! Can I ask, where did you get your wall unit in your living room? I have been looking for one like that! thank you. We actually made that out of Ikea kitchen cabinets and book shelves. Sort of pieced it together ourselves. I still need to post it. It saved us a ton of money and we were able to fill the entire gigantic space. I love looking at your home for inspiration, especially since my California tract home’s downstairs floorplan seems to be quite similar to yours! You’ve done such an amazing job working with the entry/living room/dining room open floor plan, and with such incredibly unique pieces. Can’t wait to see what you do next! That is such a lovely compliment! Thank you so much. The open floor plan is definitely both a blessing and a curse don’t you think? It presents a few design challenges, but I think I’m getting there. Thank you so much for your kind words and I look forward to seeing you around here again soon! My goodness Corey, I just want to rip the room from the screen and decorate my house like yours! 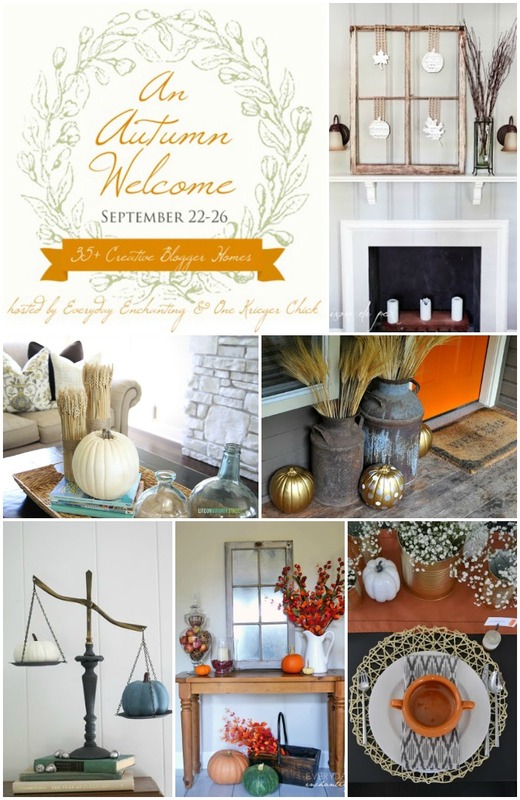 I truly struggle when it comes to fall decor, I never want to feel like I’m going overboard. Sure you said you just focused on a few key places but I think its absolutely perfect. You totally nailed the perfect amount of Fall! Anywho, I’d love to have you and your stinkin’ gorgeous tour at our Outside [the Box] Link Party. It’s live today (and every Tuesday at 5PM EST) at http://bit.ly/BlackAndWhiteObsession. A lot of decor or a little, to each his own, and yours really does look beautiful, Corey! I think your pops of orange are so much fun, and that color looks great with your gray-blue sofa. Those floating shelves look great and are the perfect spot for your string-art…..great job on that! I don’t know where you are with the 90 degree temps, but I’m in the AZ desert where we are finally on the down-side of 100 (I hope). The temps have not deterred me from an all-out “Fall Fantasy” in our home! 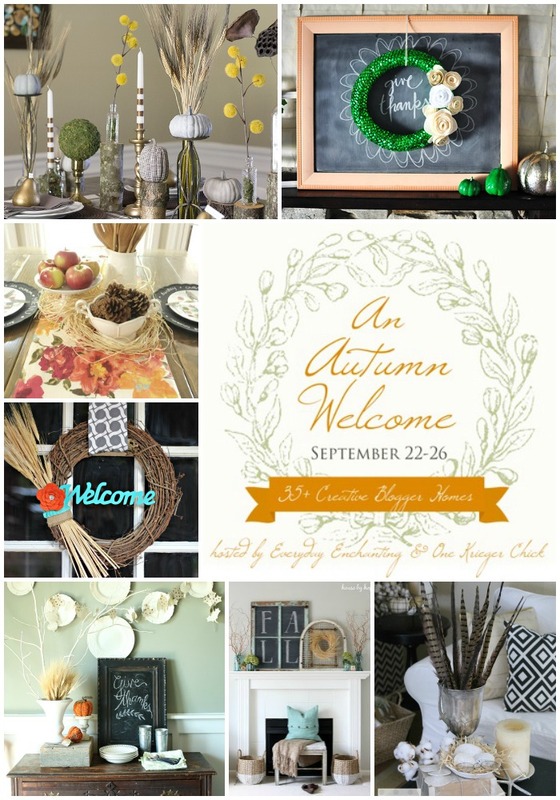 So many great hits of color and beautiful fall vignettes!! I love it….your centerpiece is one of my favourite things- the tin cans are amazing! These is so much I love about your space! I love the pops of orange and your table settings are gorgeous! Ha! That is my favorite too! My mom got it for me when I moved into my first apartment years ago and it has been my favorite ever since. Your fall decor is beautiful, Corey! I love the blue and orange. My fall decor ended up with a lot of blues and oranges kind of on accident and I really love the combination! Thanks for sharing your home with us! Hi, I’m new to your site & I’m in love! Your Fall Tour has been one of my favorites. The centerpieces are eye catching,genius, & creative all mixed in!! I love your couch & wall colors as well! I’m glad I’m not the only one who still went with vibrant colors & oranges still this fall!! Can’t wait to stop back in on your lovely blog!! You are so kind! Thank you so much for this lovely compliment. It is so nice to e-meet you and I can’t wait to pop over to your site! Love your accents of orange throughout. So refreshing and pretty!! Corey, I LOVE your home! Can I come over and hang out so I can stare at how magazine worthy every single space is? Seriously, your photos and vignettes are beautiful and I am loving your tablescape! Clearly I’m behind on comments!!! Thank you so much and of course you are welcome here any time! In fact, later this week you will only be 308 miles away, so if you get an itch to extend your trip and head further south let me know!!!! Have a fab trip! You did s great job, Corey!!! The table is beautiful! The baby’s breath in those spray painted tin cans looks perfect! Love the bright orange everywhere!! Thanks for the tour!! I love all the hits of orange and the tin can centerpiece on your table. That thankful string art is still one of my favourite fall projects!! Beautiful tour Corey! How pretty! I don’t do fall all over either and just do it in spots too. Lovely home and tour. Thanks so much! Yeah, between Christmas and fall stuff, I wouldn’t have any place to store it all! I love your Thankful string art and your incredible cabinet / shelves that surround your TV! Looks great, Corey! Gorgeous! I loved your tour, and all your fall decor! I really like the gold painted tin can centerpieces, so creative! I know what you mean about the weather, it was 80 here yesterday, hard to get in the fall spirit! I am loving the orange Corey!! Love Love Love it!! Love our vignettes on the “thankful” shelf. Also love the soup bowls. We have them in white, but the orange bowls are super cute with your place settings. Corey, your home looks so beautiful (and it’s making me super ready for fall)! I love the blue and orange color scheme. Also, I’m dying over those gorgeous soup crocks! I have an idea! I’ll send you mine and you can send them back to me with some of your amazing soup. I assume you make amazing soup since you make amazing everything else! -Joke They are from World Market and they have them in lots of colors. You need them for your photos! Such a fun house and tour! I love the gold cans! Great inspiration…fun, fun, fun!!! I have had a really hard time getting into orange this Fall for some reason… but your house is making me wish I had used orange!!! Ahh! It’s gorgeous! Lovely home tour, Corey! I love all the pops of orange around your house, and that tale is awesome!!! I love all of it – those gold spray-painted cans on your table runner are a genius idea – so effective!! And I’m digging the thankful string art. Thank you so much for sharing your lovely home with us! Loving your home tour! The perfect pops of orange and your table setting was so lovely. I need to do more can spray painting. Stunning, Corey! Your fall table is absolutely gorgeous!! I am loving the gold and orange combo for the table settings. Thanks Carmody! Gold is sorta my new thing, so I had to include it in my fall decor this year. Hope you are having a great week. Thanks for stopping by! This looks great! I love all the orange!!! beautiful! Everything looks great! I love how the orange looks in your home. It pops perfectly with the gray and teal. Thanks so much for including my print! And I love the Nest of Posies print too! I love that printable and have been waiting so long to finally get to use it!!! You are so talented lady! Love it all…especially how you incorporated your kids artwork. You have such a fun style! So glad you are a part of the tour! LOVE it all Corey! Everything looks so fun with the bright pops of orange! And I’m totally crushing on that fab string art! Thanks Kristi! I had to go with bright colors since where I live it never really gets to be fall until everyone else’s winter. I guess it is my version of Spring colors in the fall. hahaha!